Leeds has carried its strong occupational momentum from the second half of 2017 into 2018. A shortage of new build and comprehensively refurbished supply is likely to add upward pressure to rents over the next 12–18 months. During the final quarter of 2017, Leeds' office market take-up reached 207,000 sq ft, boosting end year take up to 1,014,000 sq ft - the first time Leeds city centre has exceeded one million sq ft. This was partly driven by Leeds Building Society's 81,000 sq ft letting of Sovereign House in the final quarter, as fully refurbished availability continues to decline. For the full year 2017, the public sector accounted for 39% of total take-up, which was down to the 378,000 sq ft Government Property Unit deal during the third quarter. Technology, Media and Telecoms (TMT) was the next most active sector, with take-up reaching 119,000 sq ft. Bruntwood opened Tech Hub at Platform, aimed towards digital start-ups, as the scheme continues to benefit from large floorplates and close proximity to Leeds station. Leeds carried the strong momentum from 2017 into the first quarter of 2018, with 187,000 sq ft of space taken, 10% above the previous five-year quarterly average. Key deals include legal firm, Walker Morris signing for 76,000 sq ft at 33 Wellington Street (formerly Benson House) as their new headquarters. Dart Group (parent company of Jet2. com) also signed for 48,000 sq ft at The Mint. Of the remaining 26 deals which took place in the first quarter, all were under 7,000 sq ft in the city centre. Leeds is forecast to see a 4.8% increase in office based employment over the next five years, in line with the national average, according to figures from Oxford Economics. This translates to around 9,000 additional jobs, or c.900,000 sq ft of floorspace, around half of which will be driven by the Professional and Tech sectors. However, availability is now at its lowest level since 2007 at only 1.2 million sq ft (Graph 2). Grade A availability in the city centre will also continue to decline this year and now stands at 374,000 sq ft, with no further completions expected until end 2020 at the earliest. 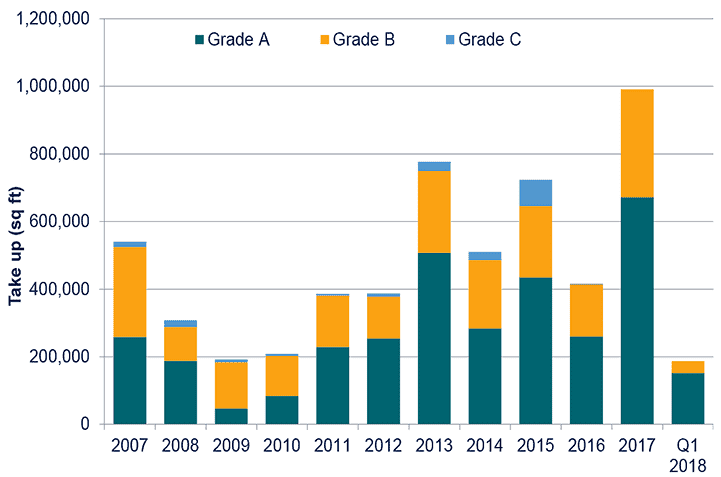 Given a five year average Grade A take up of c.296,000 sq ft in Leeds city centre, this indicates c.15 months of Grade A availability remaining in the market. MEPC's newly completed 3 Wellington Place (pictured, below) provides c.115,000 sq ft of Grade A office space with a 3,000 sq ft roof terrace. One of the next phases earmarked for development is 4 Wellington Place, which will provide c.150,000 sq ft and has detailed planning permission. Given 2017's top rent uplift from £28 per sq ft to £30 per sq ft, we expect top rents to remain at this milestone for the remainder of 2018. 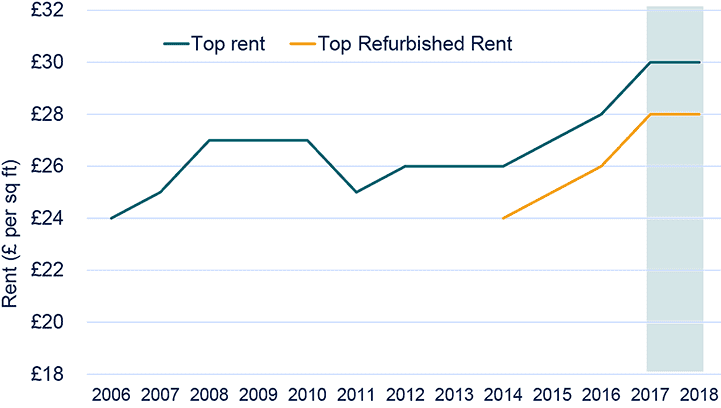 It is then likely in 2019, that we will see an upwards adjustment to £31 per sq ft.
Part of the jump in top rents during 2017 was down to refurbished rents rising to only £0.50 per sq ft below that of top rents. 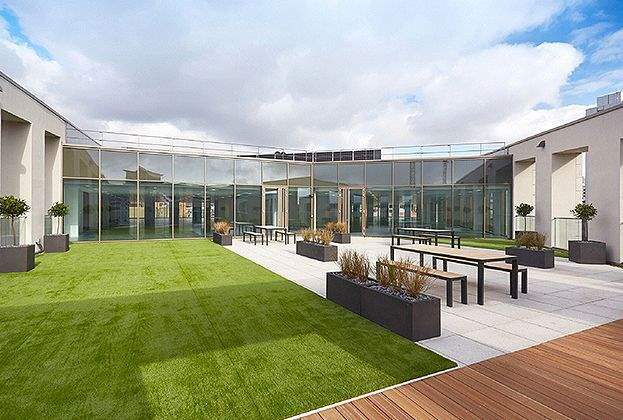 We expect rents for the best refurbished space to remain static at c.£28 per sq ft. This being said, there are still asset management opportunities for rental uplift in central locations. kamaco expect city centre take up to reach 700,000 sq ft in 2018, with large requirements from the Government, professions and serviced offices. A record 73,000 sq ft of serviced offices was taken in Leeds city centre during 2017, the highest level on record. 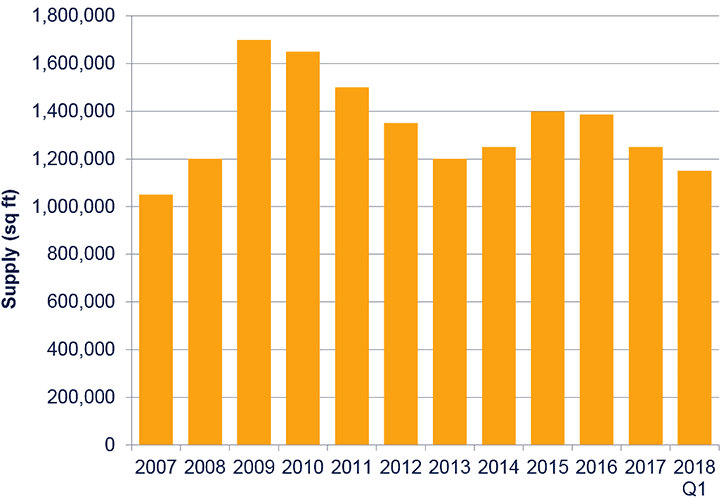 Tenants are increasingly in search of more flexible lease terms (average regional lease length fell 6% during 2017), as Regus signed for 10,200 sq ft at the Pinnacle during Q3 2018. Indeed, 4,915 startups were created in Leeds during 2017, according to Startups UK. It is these high growth companies who we expect to be looking to expand into either traditional office space or serviced office space in 2018. Traditional offices must continue to reinvent themselves in order to remain attractive and compete with serviced offices. Landlords must also adapt as tenants demand increasingly flexible lease terms. kamaco forecast c.150,000 sq ft of space will be taken by serviced office operators in Leeds during 2018. One of the reasons we expect Leeds to benefit from further northshoring over the next three years is the number of skilled professionals in the city. kamaco estimate that companies save around £20,000 per employee per year by relocating their London based roles into the regional cities- £10,000 in wage costs and £10,000 in property costs. 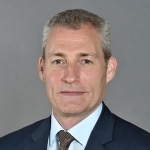 Global law firm, Reed Smith is tapping into the Leeds talent pool as it is on course to open its first UK office outside London at Platform, in early July this year. Leeds currently retains 29% of its graduates upon graduation, but to further boost this, Leeds' developers need to provide the right level of follow-on space in the city centre. With a shortage of pipeline developments in town, occupiers who are looking to increase their floorspace will soon be forced to look out of town. There were 23 out of town deals during the first quarter of 2018, 38% above the five-year quarterly average of 17 deals, including Perform Group taking 40,000 sq ft at Munroe K's White Rose Office Park. Amenity provision is becoming increasingly important in attracting occupiers out of town and it is the business parks with the best infrastructure links which are demanding a rental premium. Park and Ride schemes are becoming increasingly utilised among workers on business parks, with a large proportion of Leeds' workforce living to the north-west of the city, around Horsforth and Headingley. Zenith signed for c.63,000 sq ft at Phase One of Kirkstall Forge last year, for example. The scheme is only six minutes away from Leeds station by train and Northern Rail have recently doubled the train frequency to two per hour. Whilst 2017 was a fairly quiet year for Leeds' office investment, with volumes reaching £100 million, three Leeds offices changed hands during the first quarter of 2018 for a combined £53 million. The key deal was Mayfair Capital acquiring 6 Queen Street for £37.2 million, representing a 5.4% yield after Burberry signed for 46,000 sq ft of space across four floors last year on a 10-year lease. 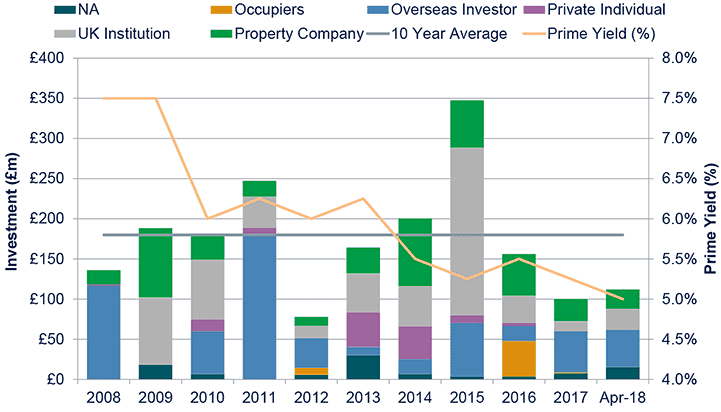 As at end April 2018, office investment volumes have reached £112m, already 12% above the 2017 total. 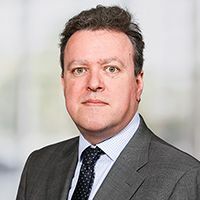 The West Midlands Pension Fund acquired City Point for £26 million from Redefine international, while Brockton Capital acquired the Pinnacle, a mixed use block totalling £65m. Sustained investor demand for long income has driven prime yields down 25 basis points (bps) from 5.25% to 5% over the past six months. Leeds prime yields remain 25 bps above Manchester and Birmingham, and we expect this to hold firm through the remainder of 2018. Overseas investors are becoming more familiar with the UK regional office markets, and are increasingly willing to look outside Manchester and Birmingham for long income. One of the drawbacks is the shortage of marketed stock in the regional markets as landlords look to avoid the round-trip costs of trading up. In the search for higher returns, Private Equity funds and overseas investors willing to take on higher risk are looking in cities like Bradford and Sheffield for income. For example, MBU Capital acquired Centenary Court from CLS Holdings last year for £14 million, which is currently let to HMRC. UK Property Companies are reaping the benefits of a tightening occupational market by asset-managing secondary into prime.